“We’re talking about dating? Ugh. . . awkward. 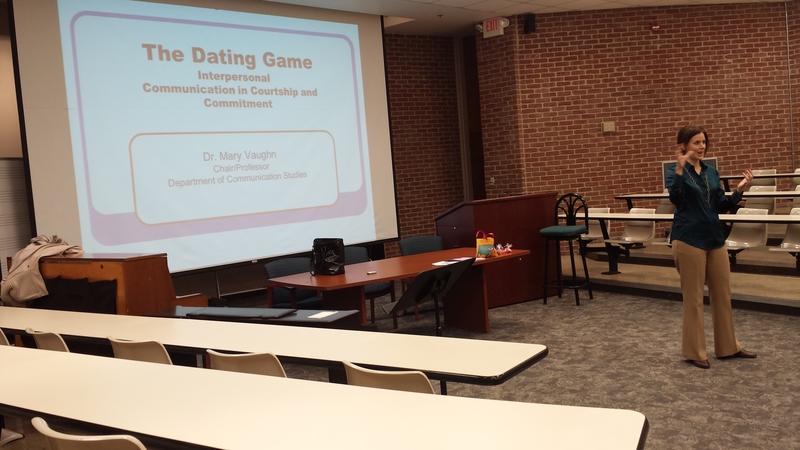 No way!” Jitters about last Thursday’s lecture topic filled the hall as the CLASS Scholars settled in for their second seminar, “The Dating Game: Interpersonal Communication in Courtship and Commitment.” But this was no lecture on hand-holding or Snapchat. Instead, Dr. Mary Vaughn, Chair of Belmont’s Department of Communication Studies, wanted to talk about the “systematic study of human behavior” that communication scholarship is centered around. Dr. Vaughn’s personal academic emphasis is on the “one on one stuff,” but the interpersonal relationships she studies reach beyond Taylor Swift’s popular breakup advice or Ed Sheeran’s eternal love promises and get down to the theories and observations that define how people really interact with each other. Dr. Vaughn began the seminar with a simple question. “What makes someone “attractive?” Looks, personality, and goals were attributes chorused around the lecture hall, along with some additional comments about personal preference or people being individually suited to one another. Dr. Vaughn confirmed these hunches with researched facts, presenting something called “The Similarity Hypothesis,” and expounding that attraction to another person is made up from a range of noticeable things like external appearance and unconscious observations like speech patterns. Then it was time to let the Scholars make some observations of their own, Dr. Vaughn had the students use interpersonal communication theory to analyze some love stories as told by real couples. First up? Early interpersonal communication. For this stage of a relationship, Dr. Vaughn presented the Scholars with Altman and Taylor’s “Social Penetration Theory” which states that the two primary goals of first interactions are to “reveal oneself” and “reduce uncertainty.” She then had the Scholars look at Steven and Alexandra, a reluctant couple who met by the joint scheming of their parents and Rachel and Ruben, lovers eventually brought together over thousands of miles by an accidental e-mail. In Steven and Alexandra’s case, the scholars were able to pick out obvious costs and rewards in phrases like “she’s cute” or “no way I’m inviting him to dinner.” For Rachel and Ruben, they were able to see how the couple reduced uncertainty in their relationship by chatting online, but a few rounds of “they’re crazy” still accompanied the story of their quick marriage. From causal first meetings Dr. Vaughn then moved into serious commitments and introduced Baxter and Bullis’ theory of “Commitment Turning Points.” To examine this theory more closely the scholars looked at Joe and Trudy, a roadie and touring musician, whose relationship, which is now a lasting marriage, was only taken seriously after their first kiss. Dr. Vaughn had opened the seminar with some statistics on commitment, stating that a recent census discovered the average ages for men and women to enter their first lifelong or marital commitment was toward the end of their twenties. With this idea of people waiting to tie the knot, Joe and Trudy’s case became a great window to see the moment when a relationship can flow from casual to something a bit more serious. The seminar concluded with the topic of relationship maintenance and how exactly to keep communication alive when life gets in the way. Here the Scholars heard the story of Sophy and Thomas, two firefighters striving to keep their relationship close as they put their lives in danger. For this stage, Dr. Vaughn discussed Baxter and Montgomery’s theory of “Relational Dialectics.” She talked about the struggle for both individual autonomy and closeness in long term relationships as well as diminishing novelty and the continued practice of self-disclosure. The Scholars identified that Sophy and Thomas were able to remain individuals in their working environment while enjoying togetherness at home, and saw a strength in their communication due to a mutual understanding of their difficult and often uncertain line of work. However, all of these new ideas and systematic observations didn’t curb the Scholars’ interest. 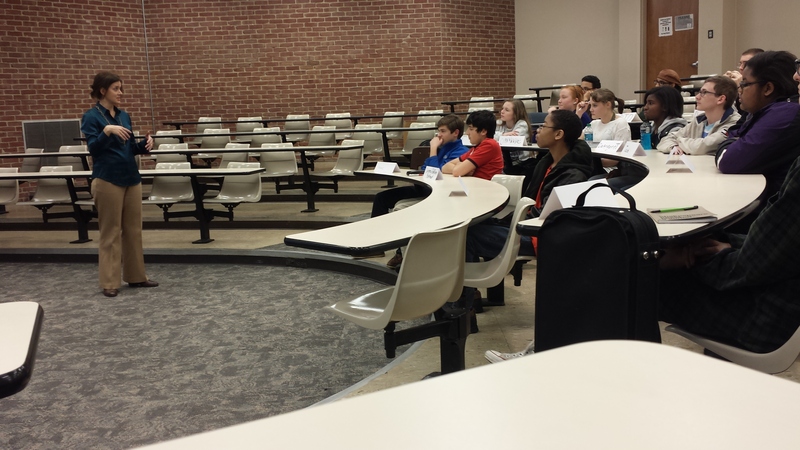 Questions lingered on after the presentation. Questions like “How are these theories applied to platonic relationships?” or “What it was like to study interpersonal communication?” “Are long term relationships in decline?” “Why did we see an adherence to traditional gender roles throughout the presentation?” “If these theories are true, why are relationships so difficult?” Always asking and always growing, the Scholars left the lecture hall last week differently than they entered it, inquiring and theorizing about this new approach to dating instead of shying away.